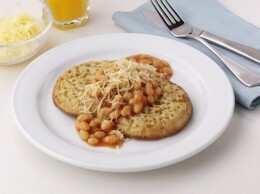 Method: Toast crumpets until golden brown. Warm baked beans and spoon on top of crumpets. Sprinkle with grated cheese. Transfer to oven tray and place under grill. Cook for two minutes or until the cheese has melted.